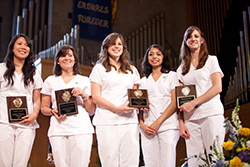 The Andrews University Department of Nursing recently achieved the incredible feat of a 100 percent overall board pass rate for the class of 2013. Nursing students are required to take the National Certified Licensure Examination (NCLEX) after graduation to receive their nursing license. Students in nursing programs and schools must reach a specific pass rate on the NCLEX each year in order for the programs to maintain state approval and accreditation for functioning as a nursing program. Every three years, the examination is updated to current nursing standards. The most recent change occurred in April 2013 when nursing programs and schools were warned by the National Council of State Boards of Nursing (NSBSN) that the next exam would be the most difficult NCLEX to date. Schools were expected to have an approximate 4–5 percent drop in their board pass rate. While the initial data collected in the summer of 2013 revealed that national board pass rates dropped approximately 9 percent instead of the projected 4–5 percent, Andrews University was pleased to discover that its board pass rates had improved rather than declined. Last spring, a total of 15 students graduated from the Andrews nursing program, 14 of which have completed the NCLEX examination and passed. Fourteen of these students passed on their first attempt of taking the NCLEX which yielded a 93 percent first-time board pass rate for the class of 2013. One student has yet to take the exam.